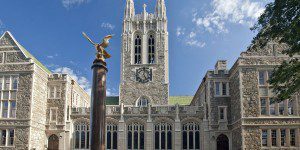 For the Boston College full-time MBA program at the Carroll School of Management, the first year is split into two semesters that can be further divided into seven-week quarters. Following a one-week orientation in late August that includes the course Introduction to Strategic Management, classes begin in early September. Second-year students focus on the functional discipline of their choice by taking semester-long elective courses. The first semester of the MBA program is highly regimented and consists entirely of required courses. Beginning the second semester of the first year, full-time students can begin taking elective courses. The second year is dedicated entirely to elective coursework. Applied or experiential learning plays a large role in the Carroll School MBA experience. Students are afforded a myriad of opportunities to learn from industry practitioners and gain exposure to real-world business problems. Through the International Consulting Project elective course, for example, students have traveled to China and Peru to complete on-site consulting engagements for clients. As part of the Warren Buffett and Berkshire Hathaway Field Experience, select students travel to Omaha in order to meet Buffett and tour Berkshire Hathaway. For students interested in technology, the school hosts weeklong “TechTreks” to New York City, Silicon Valley, and Seattle. Students also participate in a special project during their MBA studies. During their first year, students complete a Management Practice course, in which they work with live companies facing real business challenges, and deliver recommended solutions. All Boston College full-time MBA students at the Carroll School have the option to complete a series of elective courses aligned with one of the school’s nine specializations, which include asset management, business analytics, and product and brand management, to name a few. The school reports that approximately 9 percent of students are enrolled in one of their dual degree programs, such as the MBA/MSF. Just over 600 prospective candidates applied to the Carroll School of Management full-time MBA program, with 80 students earning enrollment at a selection rate of 39 percent. Students joined the program with an average GMAT score of 637, typically ranging between 580-700. Prior to enrollment, students in the program earned a 3.28 GPA, with an average of 4.5 years of professional work experience. About 31 percent of enrolled full-time MBA students in the program identify as female, with 69 percent of students identifying as male. The average age of the class is currently 28. Within three months of graduation, more than 90 percent of graduates from the Class of 2017 had received an job placement. For those students who accepted offers, the average total compensation was $108,969. The most popular industry chosen by graduates was financial services at 37 percent. About 18 percent of students entered consumer products, 12 percent pursued jobs in the pharma/biotech/healthcare sector and nine percent joined consulting firms. Current tuition for the academic year is $51,200 ($25,600 per semester). Full-time students should also budget $15,485 for room and board (per academic year), $3,095 for health insurance and $3,255 for personal expenses. The school recommends budgeting $6,250 for summer expenses. A number of scholarships are available to both domestic and international full-time students. Candidates are automatically considered for these scholarships at the time of application, and there are no additional forms to fill out. In 2015, more than 75 percent of newly enrolled students received a merit-based award. These awards averaged $44,000, and students are notified about whether they have received aid at the time of admission. Graduate assistantships entailing research or administrative work in exchange for a financial award are another option for students seeking financing, and Carroll students who are receiving scholarships may pursue assistantships as well. Students of Irish descent may qualify for a full-ride through The Denis O’Brien Fellowship. The school also encourages U.S. military veterans to contact Student Services in order to learn more about tuition reduction and an application fee waiver option. In order to apply for admission to the full-time program, first-time domestic candidates must submit a completed online application form, résumé, employment history, one personal essay, one recommendation letter, transcripts from all academic institutions attended as part of a degree-granting program, official GMAT or GRE scores, and a nonrefundable application fee of $100. International applicants must additionally submit TOEFL, IELTS or PTE scores. However, waivers for these scores are extended to international applicants who completed a four-year bachelor’s or two-year master’s degree at a school where English is the official language of instruction and those who have worked full-time in the U.S. for at least two years. Interviews at Carroll are conducted by invitation only and offered at the discretion of the admissions committee, and students may not request or schedule interviews otherwise. Candidates who applied for admission within the past year may reapply for a place in the program using a streamlined form. In addition to this form, applicants must submit a cover letter, résumé, updated test scores and transcripts if applicable and an essay. Work experience is not strictly required in order to apply for the program, although it is advised applicants have at least two years of previous experience.